Anna Nostrant preparing for a bobsled run. Anna Nostrant on a bosled run. Part of training includes pushing a 200-pound prowler, similar to those you see professional football players use in training. Sponsor and Coach Joseph Potts, at Top Speed Strength and Conditioning, is the main reason Nostrant is pursuing her off-season training in Lenexa, Kan. He was her coach in college. 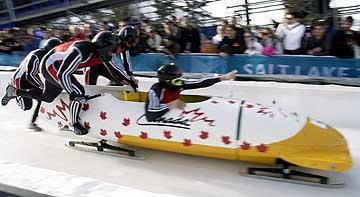 Nostrant went home to Utah and started bobsledding. She realized even though she was close to a track, she still needed a good coach to achieve her dream. Coach Potts pushes Nostrant in areas to build her speed, strength and explosiveness. Nostrant's favorite drill is what she calls the 'gold medal drill.' Nostrant stands on a platform, much like a medalist at the Olympics, then jumps off, over a hurdle and into a sprint. Training and traveling, plus working a full-time job is a full-time commitment, and expensive. But Nostrant keeps her eye on the prize. She trains wearing a shirt she made that says "Dare to Dream." Kansas may be an unlikely place to find a bobsledder in training, but 23-year-old Anna Norsant says this is where she belongs. Norsant is committed to the high-speed Olympic sport, which begins with two or four athletes pushing a snow-car-type sled at a sprinting speed, jumping in, and then descending down an ice covered run. "I mean you’re going up to 80 miles per hour around curves with 3 to 4 G’s, G-force sucking you in." says Nosrant, who hopes to make the 2018 USA Olympic bobsled team. "I mean it’s kind of like being sucked into a black-hole going down a windy course." Nostrant pursues her off-season training at Top Speed Strength and Conditioning in Lenexa, Kan., so she can work with Joseph Potts, her coach and sponsor. Nostrant met Potts at Mid-America Nazarene University, where she played volleyball and he was the strength and speed coach. When she went home to Utah and started bobsledding, Nostrant says, she realized even though she was close to a track, she still needed a good coach to achieve her dream. "He already knows me," Nostrant says. "And so he knows he can push me to a certain extent. He knows that he can say certain things to get me going. And it’s great to have that good relationship where we understand each other in that way." The feeling is mutual. Potts says that Nostrant is a fun athlete to work with. "She’s willing to push herself beyond what most people are willing to go to. She’ll reach her threshold and then continue," Potts says. Nostrant intends to work with Potts over the next four years to build her strength, speed and explosiveness. She hopes to bulk up enough — 10 pounds a year — to be able to push a sled up to 500 pounds at a sprinting speed. It’s a full-time time commitment, and it’s expensive. On top of training and traveling from Canada to Utah and Kansas City, Nostrant also works full-time. She’s still looking for people to sponsor her. But her eye is always on the prize. "For the gold medal," says Nostrant as Potts pushes her during a workout. She does sprints, core work, reps of pushing a 200-pound prowler like you see NFL players do in training. And then there’s her favorite, what she calls the “gold medal drill.” Nostrant stands on a platform, much like a medalist at the Olympics, then jumps off, over a hurdle and into a sprint. Potts encourages Nostrant, telling her she looks powerful. She does. "You know it wasn’t a dream for me as a kid," says Nostrant, who trains wearing a shirt she made that says Dare to Dream. "But once I realized how fun it was, and how much I did enjoy it, and the challenge that it brought to me... Dare to dream big, I mean go for it!"